This is another cool edition of the Fido Fun & Games classes! Don’t wait to register or you’ll miss it. This indoor class (beat the heat!) is a fun 6 weeks long. Let the games begin!You can think of Urban Herding (also called Treibball) as herding without sheep. 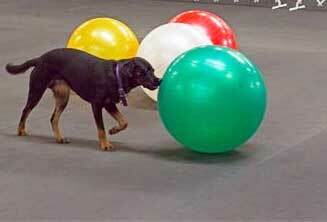 Instead, dogs herd exercise balls into a goal, using their noses to push the balls in the right direction. Best of all, any breed can do it. Try it, it’s really so much fun! We’ll teach the basics of Urban Herding including distance control commands to get you started in this fabulous new dog sport. High energy dogs are great for the sport – you do NOT have to have a “herding” breed. If your dog takes direction well (for example, if the two of you have tried your hand at agility, rally or obedience training with success), then the two of you will love Urban Herding. 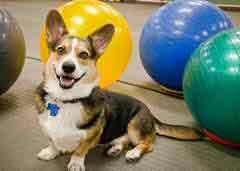 This class combines problem-solving, fetching, chasing, and elements of tricks, agility and retrieving. It’s a blast – and a great way to engage your dog’s body and mind while deepening the bonds of communication to improve your everyday enjoyment of one another. Prerequisite: Your dog must be friendly toward other dogs and people and be under control around other dogs. Your dog must have some basic obedience skills, attention on you around other dogs, and preferably has graduated from an obedience class. Want to spend time with your dog having lots of fun? Looking for ideas and activities? Then this class is for you! It promotes better teamwork and communication between you and your dog. It’s great fun for any energetic dog who works well off-leash and needs a job, or any dog who likes to herd and doesn’t have sheep. It’s a great low impact activity for older dogs (and older handlers). You’ll both have tail-wagging fun! Check out videos from the American Treibball Association.